Last week I ordered a pair of Dream Player Pro starter kits from Pricom Design. They arrived this week. These are professional-quality audio players used not only for model railways but also for exhibits such as museum dioramas. 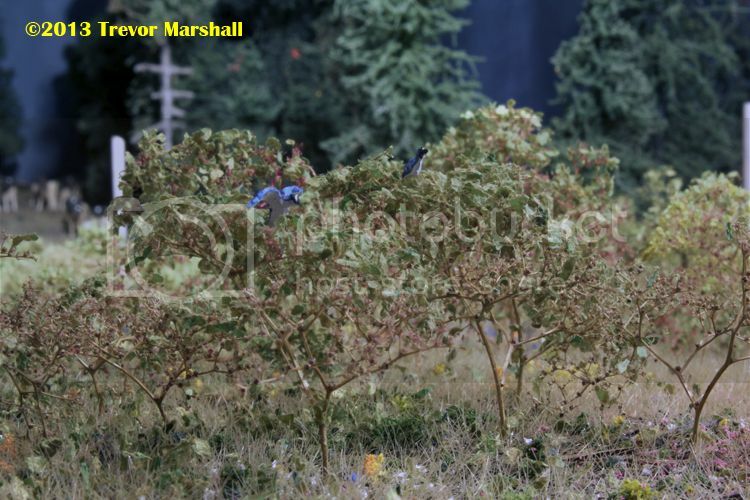 They can be programmed to run multiple tracks at the same time, and each track’s behaviour can be controlled. So, for instance, some tracks can run continuously (in loop mode), while others can be controlled via a trigger – a push-button, a motion detector, or another method. It’s even possible to use the accessory outputs on a DCC decoder to trigger sounds. I have another mount and drip shield already mounted nearby for two more Dream Players. Each Dream Player is powered from a wall-wart (included in the starter set). 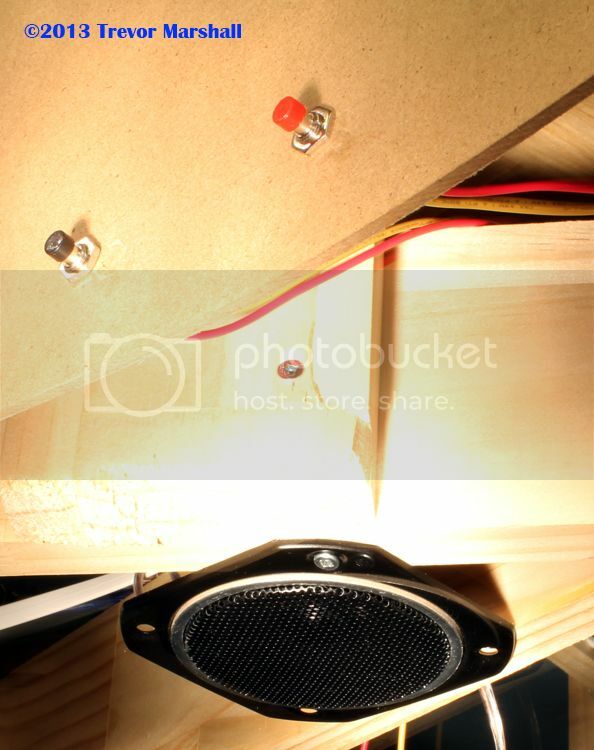 I had some speakers that I used on a previous layout that do not have built-in amps, but Pricom’s instructions note that these boards can drive unpowered speakers – they will just be at low volume, like listening to headphones. I was looking for background sound and a test proved that my speakers provided plenty of noise for what I had in mind, so I went with them. Otherwise, my local computer shop has a good selection of small desktop speakers, and any of them would’ve worked fine. The first board delivers audio for the meadow in Port Rowan – with the right-channel speaker located near the depot and the left channel speaker just to the left of the apple orchard. Sounds on this board include redwing black birds, house sparrows, blue jays and cicadas. I adjusted the balance and volume of each of these sounds when building my tracks so that different sounds are emphasized depending on where one is standing. For example, the blue jays appear mostly in the left channel, while the redwing black birds are mostly in the right. The second board delivers audio for the Lynn Valley – with the right-channel speaker located under the Lynn River at the steel girder bridge, and the left-channel speaker located in front of the trestle. Sounds on this board include cattle (right channel), swans (left channel), cardinals and crows. And, of course, the sound of the river – which turned out to be the hardest thing to mix properly, but through several rounds of trial and error I was able to come up with something that can be heard while standing in the Lynn Valley, but not so much when elsewhere in the room. I am thinking about suitable triggers for the meadow – but I’m in no rush. Meantime, I’m also thinking about bird calls and other ambient sounds I want to add in the St. Williams area. St. Williams will require at least one more board – but I’m so impressed by the Dream Player Pro that I’ve already ordered two more. 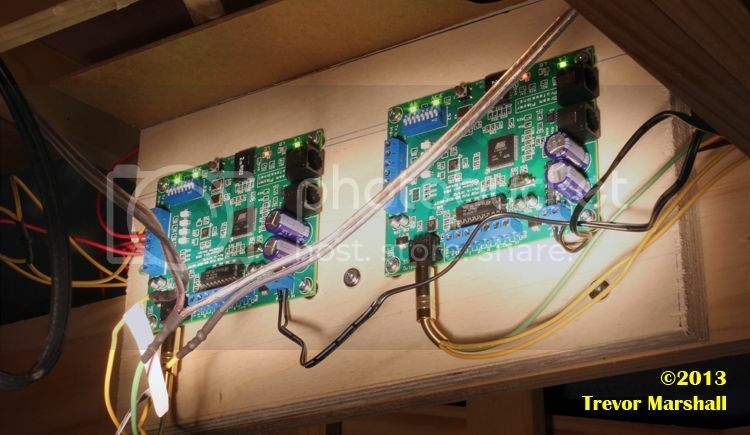 The first board will give me two channels in St. Williams – probably located at either end of the run-around track. The second board gives me flexibility to add two more channels – perhaps at the road crossing in St. Williams, and on Bay Street in Port Rowan. I can think about this while I’m waiting for the next order of Dream Players to arrive! Very cool! Between the stellar scenery, the realistic operations and thoughtfully considered soundscapes, you will have a museum quality interpretation of this area and era. I’m actually surprised at just how different the layout environment feels with the simple addition of some birdsong and insect buzzes. I’ve always been turned off by the tendency for layout sound to be too busy or gimmicky. But a few nature sounds really does set the mood – and I’d do it again, for sure! Cicadas… that’s the sound rural southern Ontario! Cool idea. I’ve got to check this out. C’mon over some time: We’ll run trains and you can hear the cicadas for yourself. As for cannons… I think you killed the idea by yourself, so I won’t have to. I can just imagine a cannon going off as someone is trying to uncouple a car – and the apologies for punching a hole in the end of the car with the uncoupling pick. I actually like the idea of when approaching an area that it would go silent, much like nature, once the creatures became uesd to human presence, then activity would start again. Only thing missing is the smell of the real place (scent is the biggest memory trigger of them all). Have experienced an attempt at this, at an exhibition in the UK. Coal smoke can be a bit unpleasant, depending on the sulphur content, so getting a gentle waft of scent is quite important and also quite difficult. Yes, my memory is of a somewhat over-powering experience, the more so as I was present on the layout opposite for the whole weekend! I think I can draw the line at smell. And taste. If I catch anybody tasting the scenery, they’re out. It’s OK Simon, Trevor asked me to bring some manure in from the nearby farm when I visit this week. We’ll just spread it around under the benchwork. For those reading along who do not have Trevor’s access and “prior experience” in audio editing, the FREE “Audacity” audio editing app is very potent, capable of producing DreamPlayer-Ready WAV files, easy to use, (if you’re reading this, and can type an email, you’ve got all the “PC skills” you need to drive Audacity), and did I mention it’s FREE? Yes, I’m having lots of fun with the Dream Players. I’m looking forward to the next batch arriving so I can complete the sound installation. I thought about mounting the speakers to point up through the scenery, as you suggest. But I did not have an easy way to do that: The scenery base is roughly 2″ thick and made of foam board. Plus, I would’ve had to break through the meadow to let the sound out, and I like the scenery I’ve done so far too much to mess with it. That said, I’ve mounted the speakers at the front edge of the fascia, pointing down, and adjusted the sound so the level is appropriate when viewing the layout normally. The fact that the sound is indirect helps mask its source, too, I think. The bird calls sound like they’re coming from the trees – because that’s where the eyes tend to look when one hears a bird call. Meantime, the water sounds like it’s in the river. I’m really happy about that! I should’ve mentioned that Audacity is one of the editors I’m using. It came bundled with the Behringer 8-channel audio mixing board I used to produce The Model Railway Show. I use Audacity to capture recordings and edit individual tracks. Then I build my sound files in Garage Band – I find it easier to juggle multiple channels in Garage Band, adjusting volume and balance for each instance of each sound. 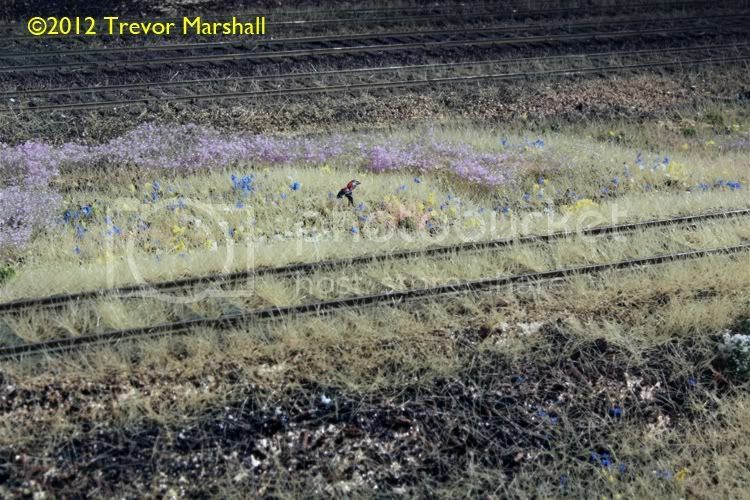 As an example, the track I built for the meadow has more than 80 channels. For those unused to modern audio editing that may sound excessive, but by assigning a single sound to each channel I was able to do things like suggest movement. I created three channels, added the sound clip to each so that they’d play one after the other, with a pause between each. Then I adjusted the balance and volume of each track so it sounds like the blue jay is flying away and to the left. very cool! I’m thinking of something like this for the Gravel Crusher. Did you investigate Boulder Creek’s new 8 channel player? – The DP allows full-res 48kHz 16bit stereo WAV files to be copied onto an SD card and loaded seamelssly. The BH uses realtime recording and no external storage/backup/’extensible” audio memory. Great comparison by ProfKlzyr of those two systems. I agree; sounds like no contest. Like a professional major league baseball player up against a little kid playing t-ball. Thanks. No, I didn’t look at the Boulder Creek player. I went with the Pricom based on the recommendation of Jim Wells, who was a guest on The Model Railway Show. – the DP has a max capacity (using a single 16Gb SD card) of over 25 hours of audio, not a comparatively tiny 4 minutes. – the DP is fully configurable in terms of playback behaviour, randomised playback of files, “background file” operation, Trigger Input and Control Output behaviour, etc etc. I should add to the Prof’s comments that I went with the top tier Dream Players because I wasn’t sure exactly how I was going to use them and I wanted the additional flexibility to let me play around with ideas. But Pricom also offers other sizes – including the Dream Player LITE for $39 ($59 in a starter pack with micro SD card and wall wart) – that would do the trick for many applications. It sure sounded good to me! Thanks Chris. Great to see you! Thanks – I’m quite proud of this little enhancement. I thought it up while installing electronics for controlling frog polarity and it was a real “a-ha!” moment for me. The masonite drip strip is a great idea that I’ve never thought of before. 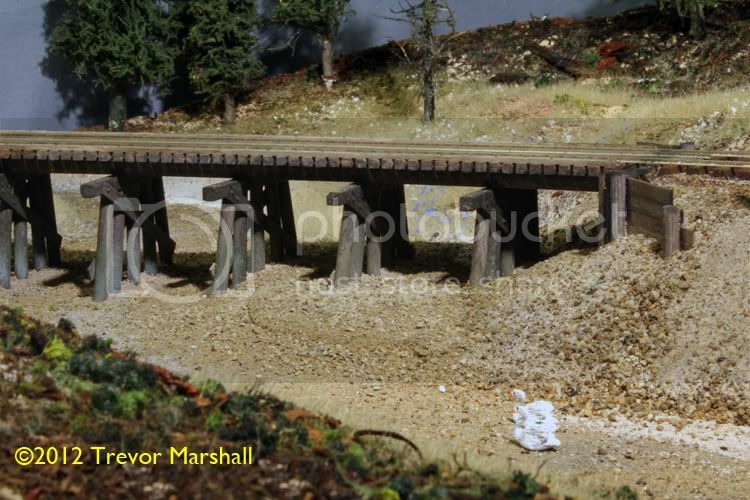 This is a great article on ambient sound on the layout. 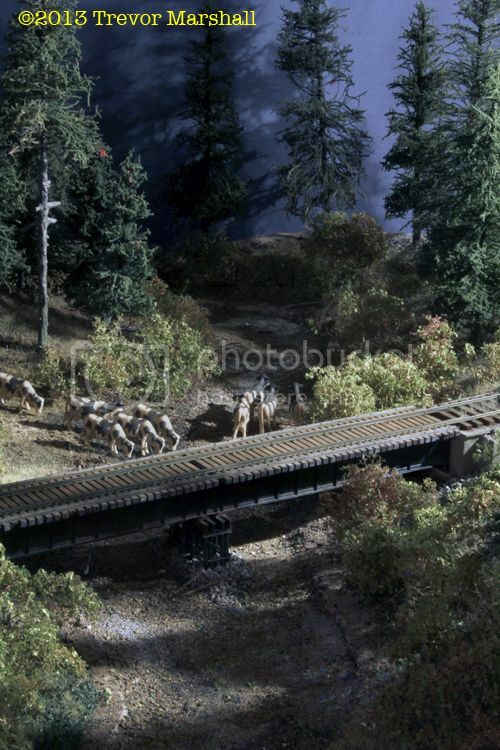 I’m thinking that eventually on my Algoma Central layout that it would be nice to do some similar things with playing nature sounds in the background, since 90% of my layout will be remote northern Ontario backwoods railway. In a couple of places I’ll have sawmills and an ore processing plant, and some industrial auditory scenery would be a great enhancement to that, when you’re standing next to those scenes to hear the saws or heavy equipment, and peaceful forest sounds everywhere else. And you’re 100% right about keeping the volume low and barely audible so it fades into the background. Even the majority of sound locomotives have the sound output turned up way too high out of the factory, and should be turned down to sound better on the layout and so you don’t hear it at full output at the far end of the whole layout. Some great follow-up comments on this post too.